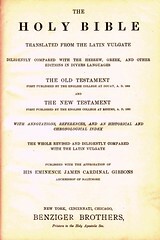 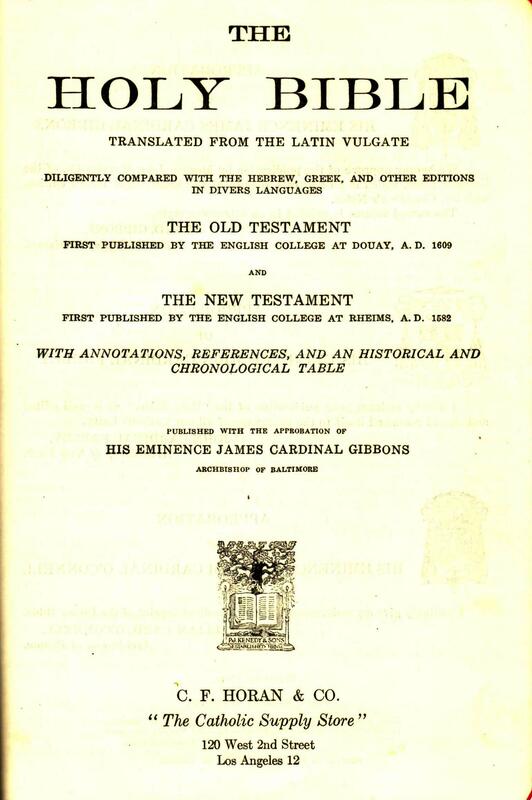 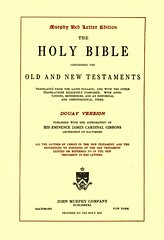 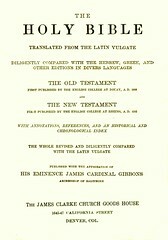 Contents The complete Bible in the Douay Version as revised by Challoner. 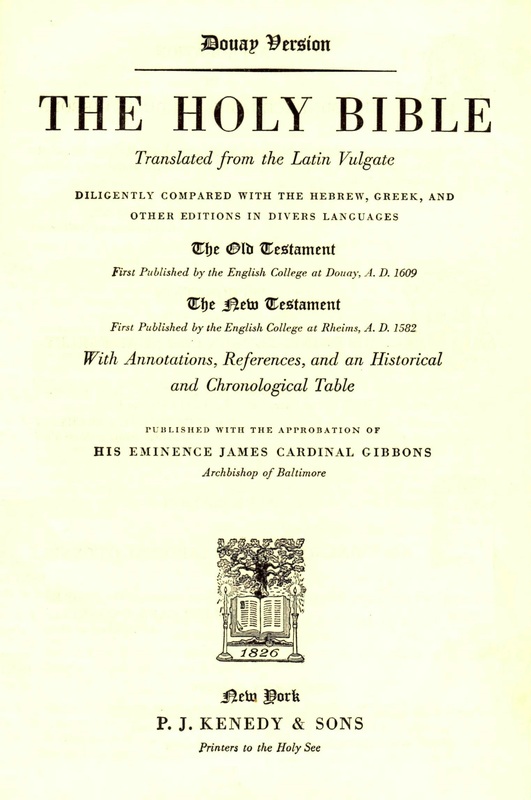 Comments A variant showing the publisher with a different Baltimore address. 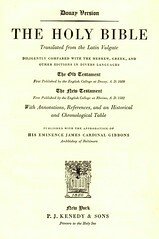 Comments A variant showing the publisher with Baltimore and New York locations without addresses. 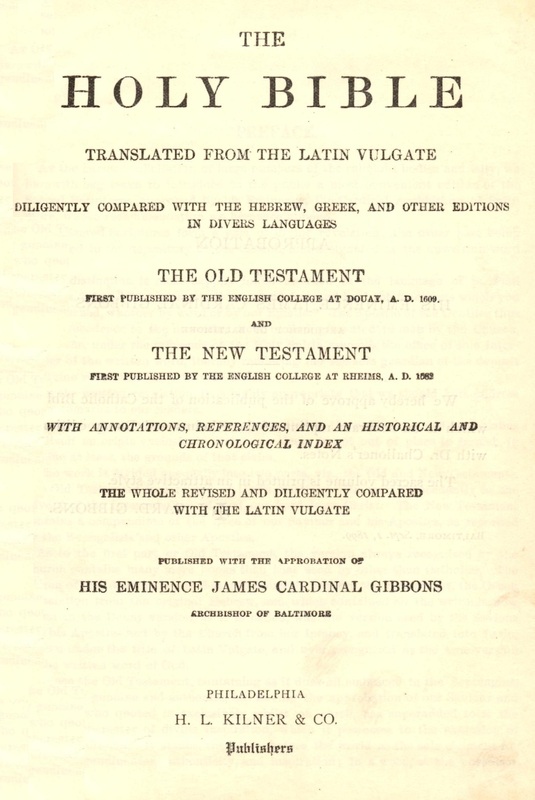 This same title page design appears with several variations on the verso: some with the Approbation of Cadinal Gibbons dated 1899, others with the verso blank, others with undated approbations from both Cardinal Gibbons and Cardinal Farley on New York (elected 1902), and others with undated approbations from Gibbons, Farley, and Cardinal O'Connell of Boston (elected 1907) and a 1914 Copyright date. 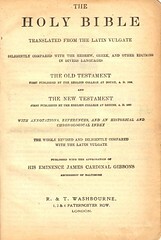 The last of these in cited in HILLS 2217. 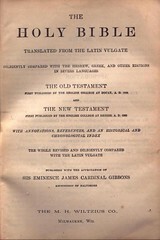 Publisher Benziger Brothers, New York, etc. 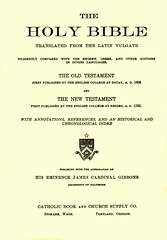 Comments Variant with the imprint of Benziger Brothers, an international Catholic publisher. 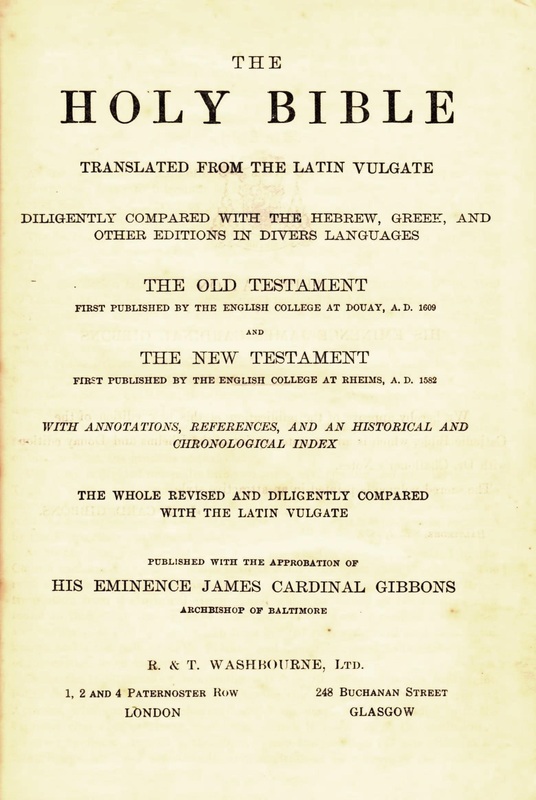 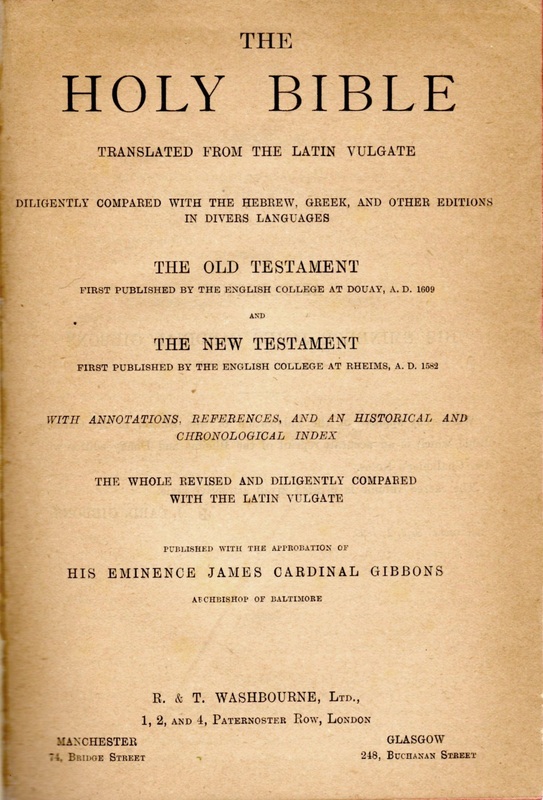 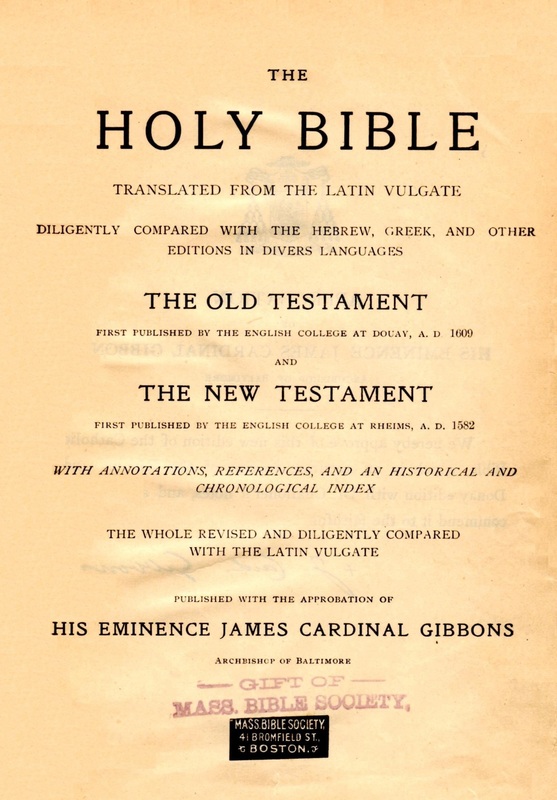 Title The / Holy Bible / Translated from the Latin Vulgate / Diligently Compared with the Hebrew, Greek, and Other Editions / in Divers Languages / the Old Testament / First Published by the English College at Douay, A.D. 1609. 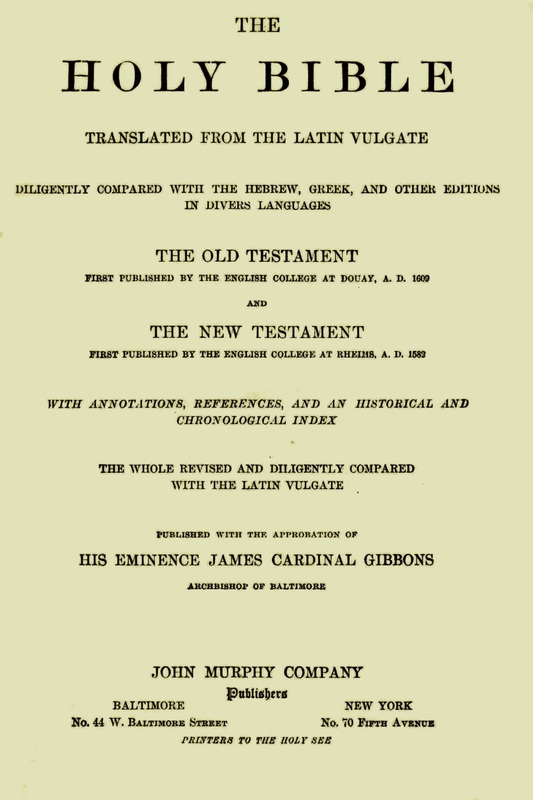 / and / the New Testament / First Published by the English College at Rheims, A.D. 1582 / with Annotations, References, and an Historical and / Chronological Index / the Whole Revised and Diligently Compared / with the Latin Vulgate / Published with the Approbation of / His Eminence James Cardinal Gibbons / Archbishop of Baltimore / The M. H. Wiltzius Co., / Milwaukee, Wis. 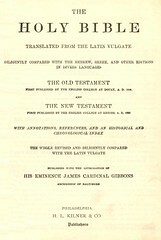 Comments An edition with a local imprint. 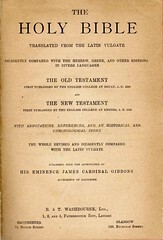 Comments A variant of the above adding a New York location to the publisher's imprint. 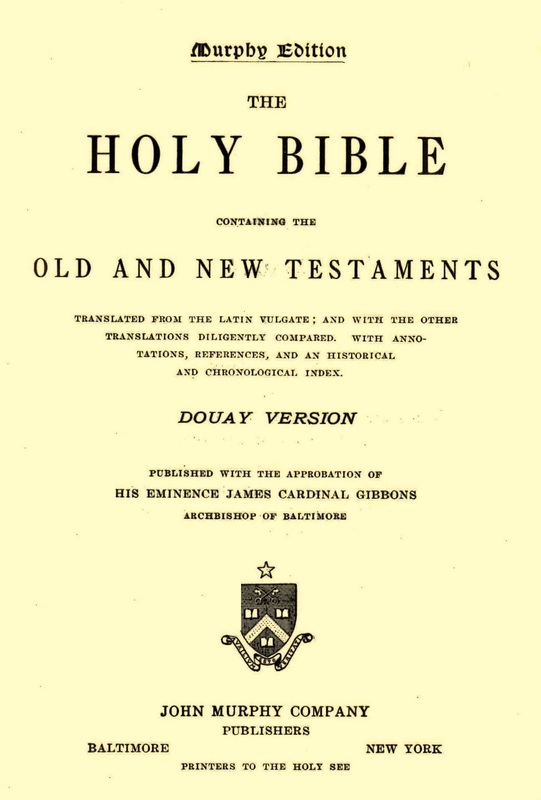 Title The / Holy Bible / Translated from the Latin Vulgate / Diligently Compared with the Hebrew, Greek, and Other Editions / in Divers Languages / the Old Testament / First Published by the English College at Douay, A.D. 1609. 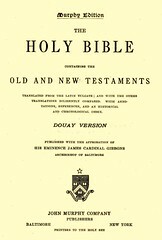 / and / the New Testament / First Published by the English College at Rheims, A.D. 1582 / with Annotations, References, and an Historical and / Chronological Index / the Whole Revised and Diligently Compared / with the Latin Vulgate / Published with the Approbation of / His Eminence James Cardinal Gibbons / Archbishop of Baltimore / Douay Bible Publishing Co., / Philadelphia, Pa. 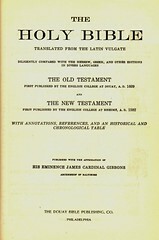 Comments An edition with a local imprint. 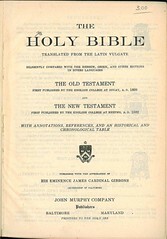 The words "Picrorial Edition" at the top of the title page are hand stamped. 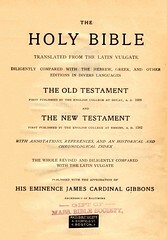 Title The / Holy Bible / Translated from the Latin Vulgate / Diligently Compared with the Hebrew, Greek, and Other Editions / in Divers Languages / the Old Testament / First Published by the English College at Douay, A.D. 1609 / and / the New Testament / First Published by the English College at Rheims, A.D. 1582 / with Annotations, References, and an Historical and / Chronological Index / Published with the Approbation of / His Eminence James Cardinal Gibbons / Archbishop of Baltimore / John P. Daleiden Co. / 1530 Sedgwick Street / Chicago, Ill. 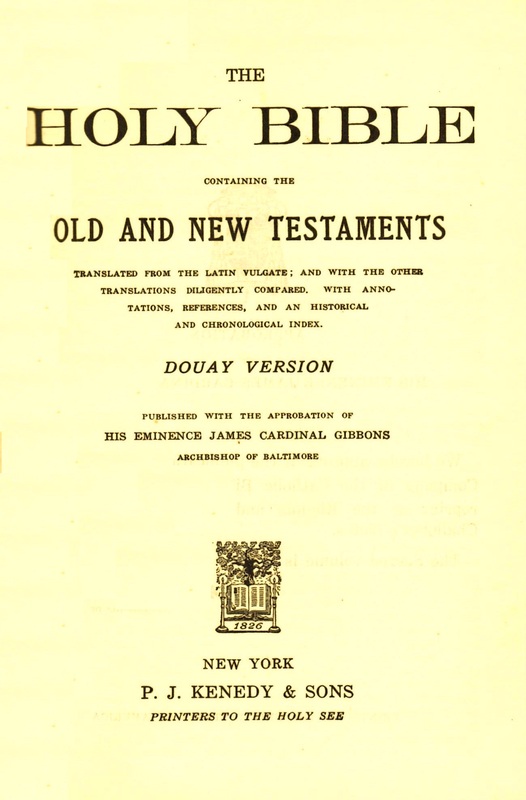 Title The / Holy Bible / Translated from the Latin Vulgate / Diligently Compared with the Hebrew, Greek, and Other Editions / in Divers Languages / the Old Testament / First Published by the English College at Douay, A.D. 1609 / and / the New Testament / First Published by the English College at Rheims, A.D. 1582 / with Annotations, References, and an Historical and / Chronological Index / Published with the Approbation of / His Eminence James Cardinal Gibbons / Archbishop of Baltimore / The E. M. Lohmann Company / 385-387 St. Peter St. / St. Paul - Minn. 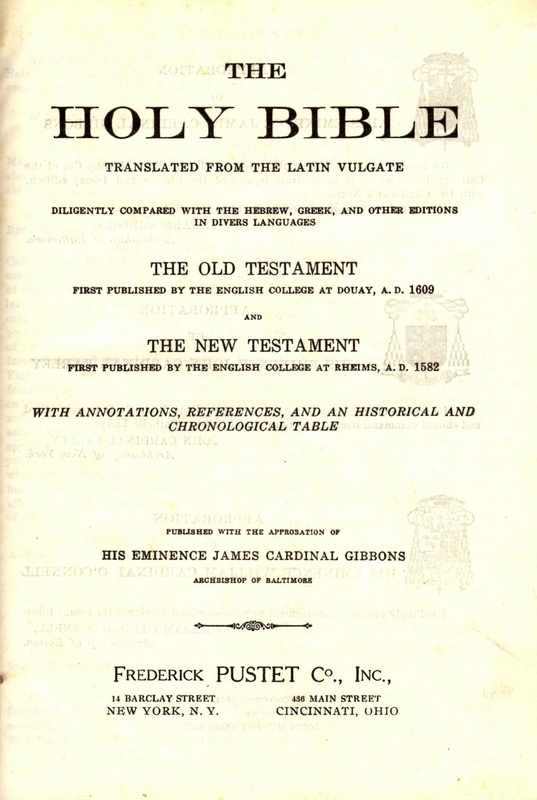 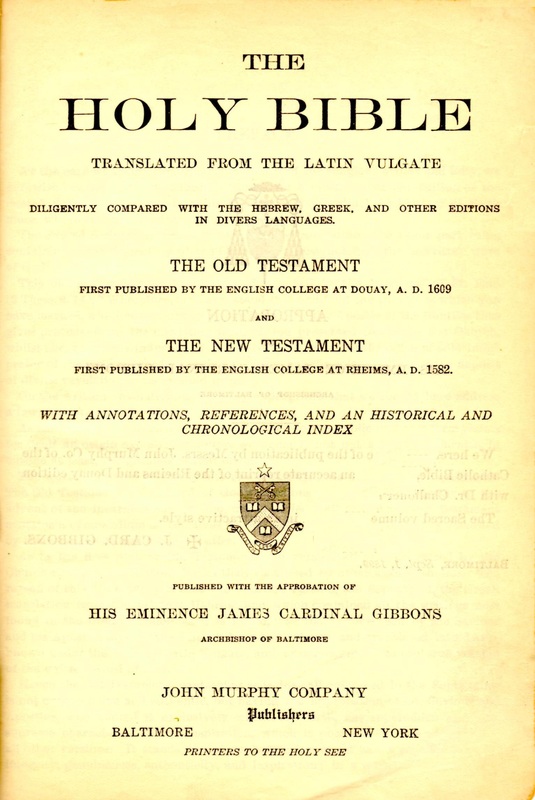 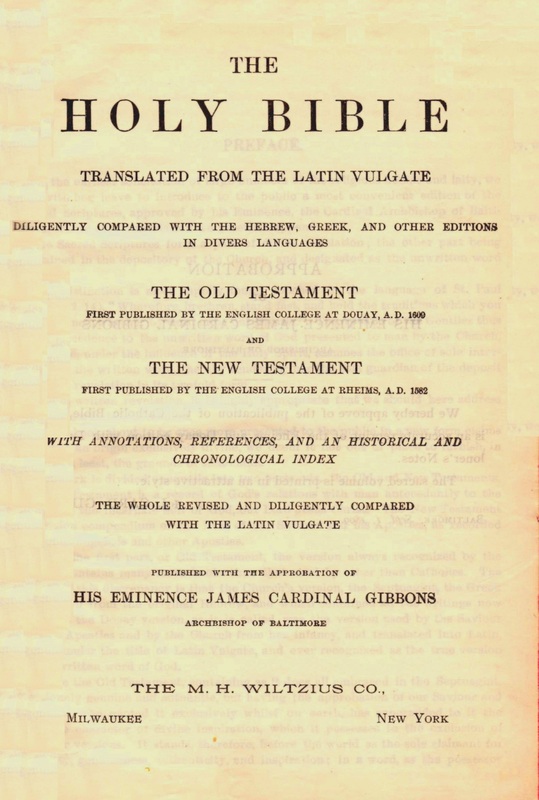 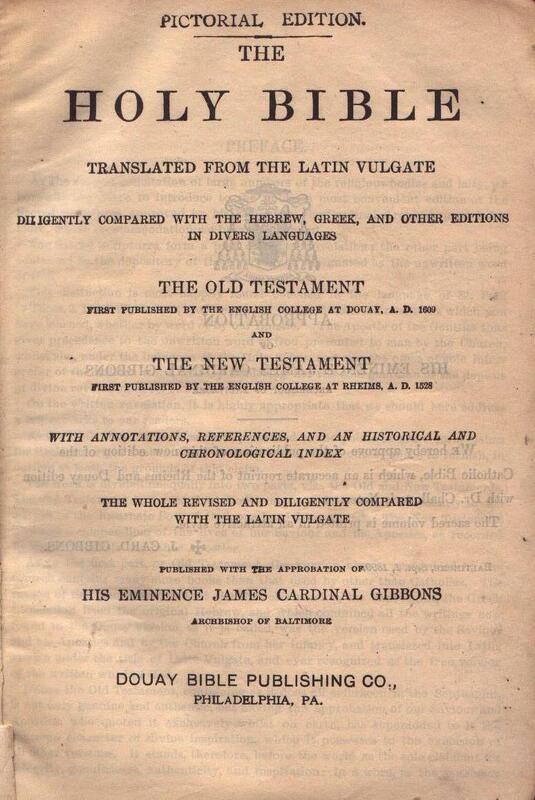 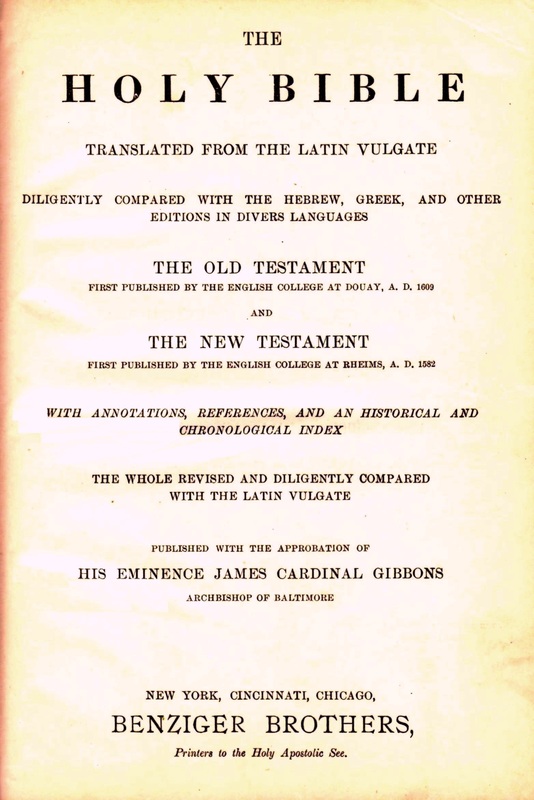 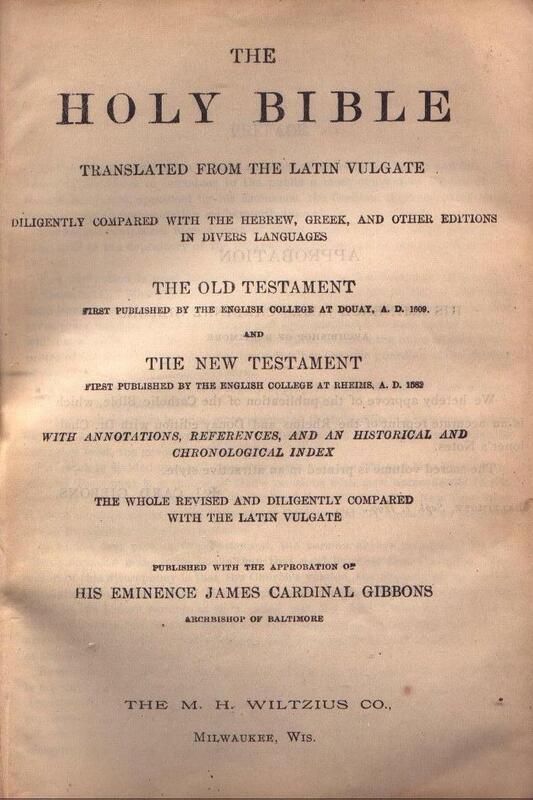 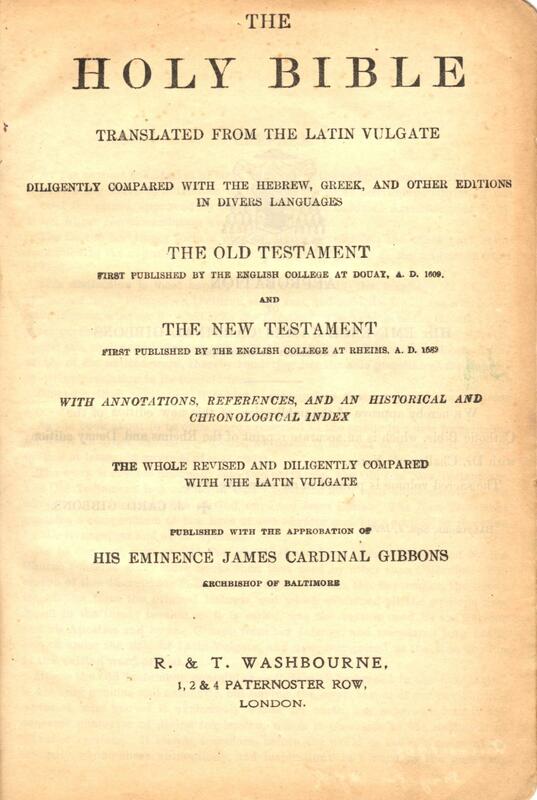 Title The / Holy Bible / Translated from the Latin Vulgate / Diligently Compared with the Hebrew, Greek, and / Other Editions in Divers Languages / the Old Testament / First Published by the English College at Douay, A.D. 1609 / and / the New Testament / First Published by the English College at Rheims, A.D. 1582 / with Annotations, References, and an Historical and / Chronological Index / The Whole Diligently Compared / with the Latin Vulgate / Published with the Approbation of / His Eminence James Cardinal Gibbons / Archbishop of Baltimore / The James Clarke Church Goods House / 1645-47 California Street / Denver, Col. 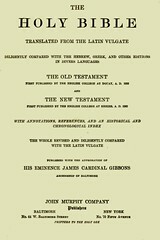 Comments An edition with a local imprint carelessly applied at a slight angle off register. Title The / Holy Bible / Translated from the Latin Vulgate / Diligently Compared with the Hebrew, Greek, and Other Editions / in Divers Languages / the Old Testament / First Published by the English College at Douay, A.D. 1609 / and / the New Testament / First Published by the English College at Rheims, A.D. 1582 / with Annotations, References, and an Historical and / Chronological Index / the Whole Revised and Diligently Compared / with the Latin Vulgate / Published with the Approbation of / His Eminence James Cardinal Gibbons / Archbishop of Baltimore / R. & T. Washbourne, / 1, 2, & 4 Paternoster Row, / London. 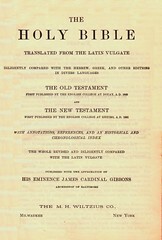 Comments An edition for export to England. 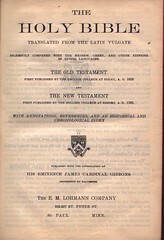 Comments A variant of the above adding the name "Ltd." to the publisher's name and a new location, Glasgow. 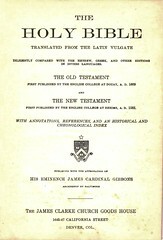 Comments Another variant of the British edition, adding a Manchester location. 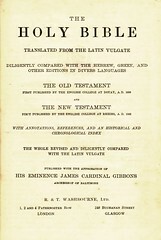 Comments Another variant of the British edition, adding a Birmingham location. 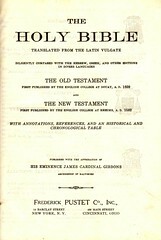 Comments This copy features the hand stamp and sticker of a state Bible Society. 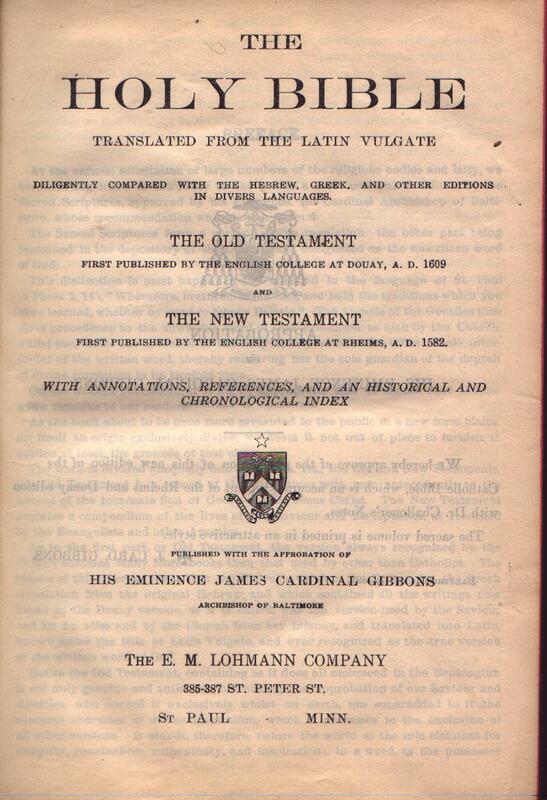 There is no pre-printed publisher name. 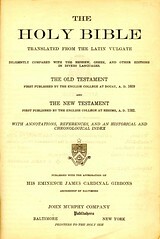 Comments This is a smaller size edition with an Imrpimatur date of 1911 on the title verso. 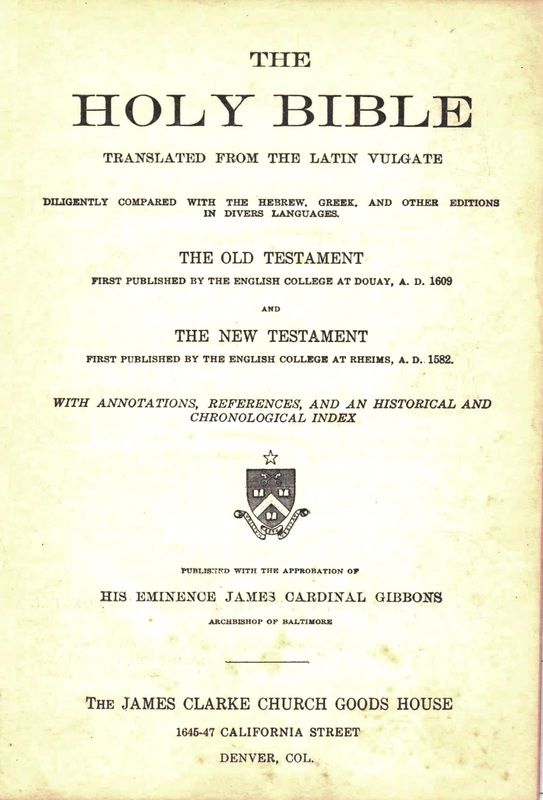 Comments An early 20th century reprint with Approbation of Cardinals Gibbons (Baltimore), Farley (New York), and O'Connell (Boston). 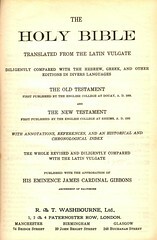 The title verso has a copyright date of 1914. 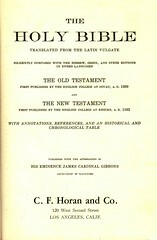 Comments An early 20th century reprint with Approbation of Cardinals Gibbons (Baltimore), Farley (New York), and O'Connell (Boston). 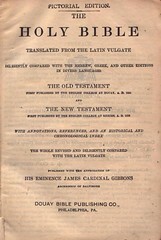 Comments Edition with local bookseller imprint. 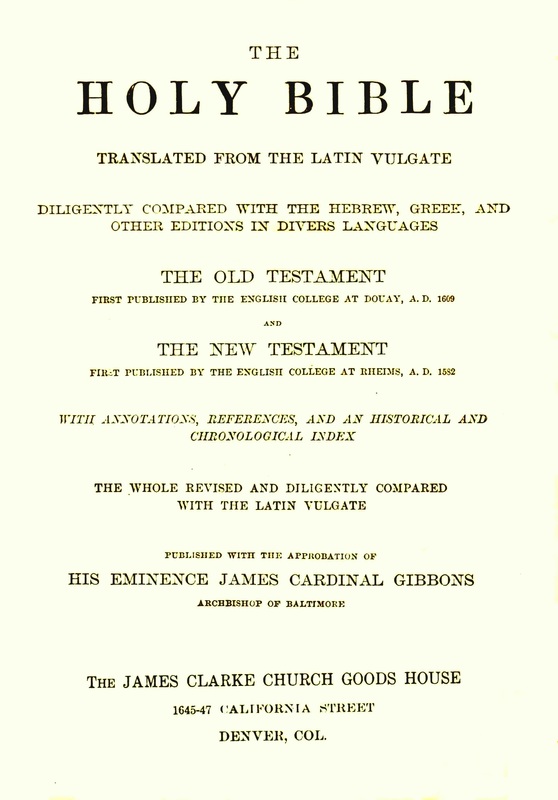 Title The / Holy Bible / Translated from the Latin Vulgate / Diligently Compared with the Hebrew, Greek, and Other Editions / in Divers Languages. 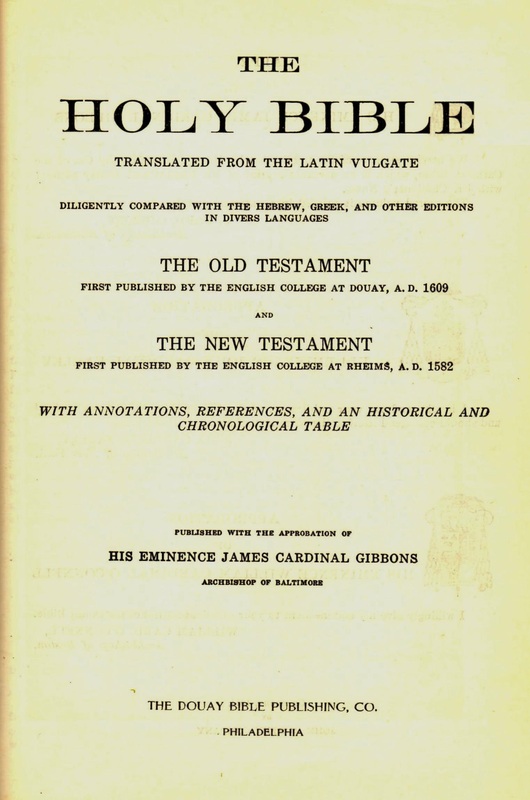 / the Old Testament / First Published by the English College at Douay, A.D. 1609 / and / the New Testament / First Published by the English College at Rheims, A.D. 1582 / with Annotations, References, and an Historical and / Chronological Index / Published with the Approbation of / His Eminence James Cardinal Gibbons / Archbishop of Baltimore / The James Clarke Church Goods House / 1645-47 California Street / Denver, Col. 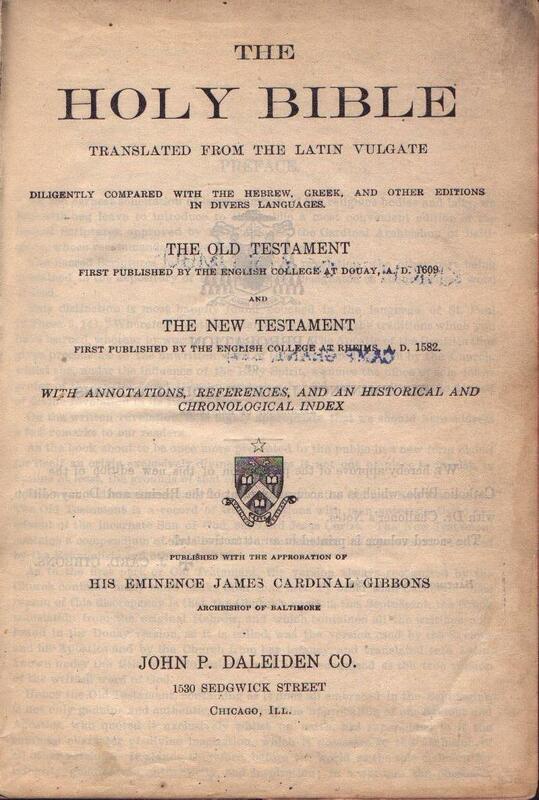 Comments Another edition with this local bookseller imprint, this time adding Archbishop Gibbons' seal. 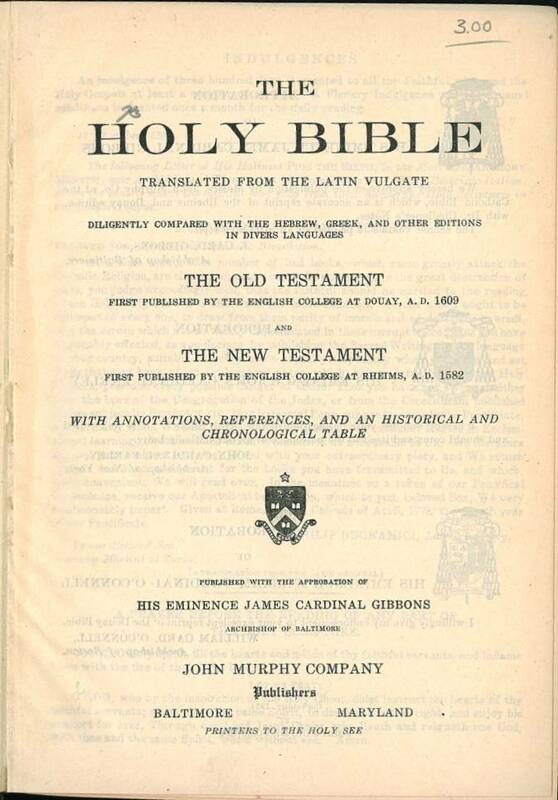 Title The / Holy Bible / Translated from the Latin Vulgate / Diligently Compared with the Hebrew, Greek, and Other Editions / in Divers Languages. 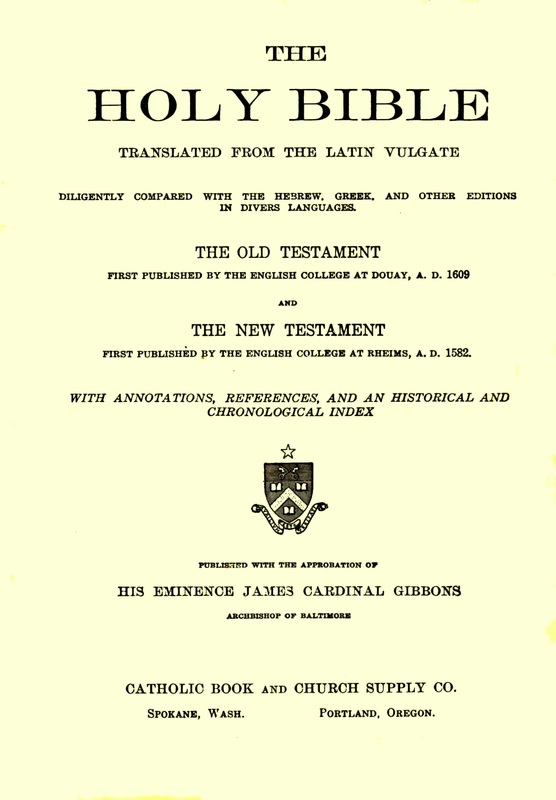 / the Old Testament / First Published by the English College at Douay, A.D. 1609 / and / the New Testament / First Published by the English College at Rheims, A.D. 1582 / with Annotations, References, and an Historical and / Chronological Index / Published with the Approbation of / His Eminence James Cardinal Gibbons / Archbishop of Baltimore / F. M. Kirner / 608 Penn Ave.; Pittsburgh, Pa. 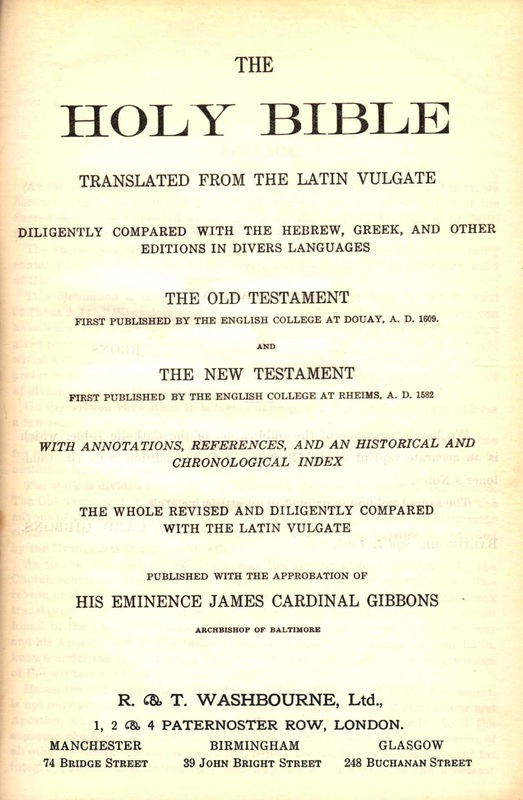 Comments Another edition with this local bookseller imprint, this time adding Archbishop Gibbons' seal . 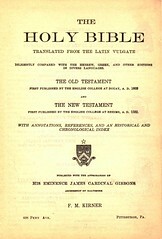 Comments Sometime before 1924, the plates for this series were purchased by P.J. 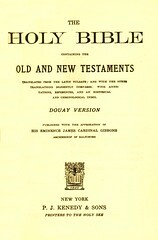 Kenedy & Sons of New York. 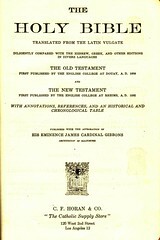 Comments This is a smaller size edition. 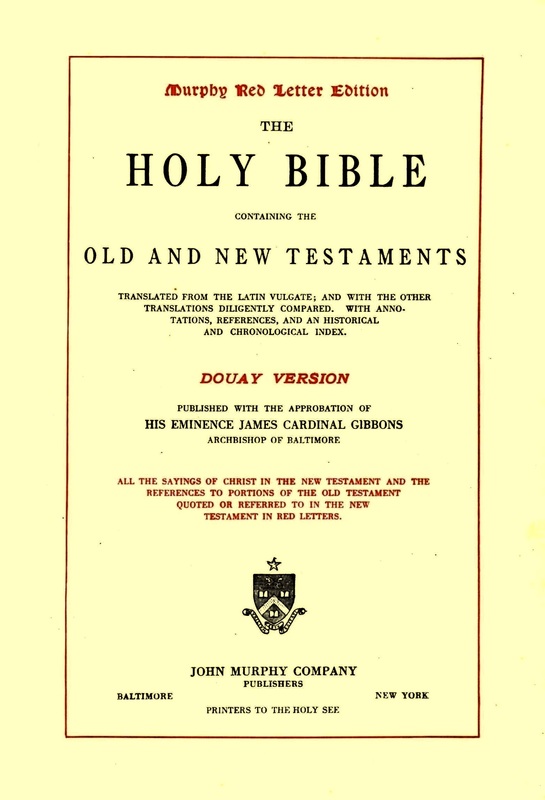 Title The / Holy Bible / Translated from the Latin Vulgate / Diligently Compared with the Hebrew, Greek, and Other Editions / in Divers Languages / The Old Testament / First Published by the English College at Douay, A.D. 1609 / and / the New Testament / First Published by the English College at Rheims, A.D. 1582 / with Annotations, References, and an Historical and / Chronological Table / Published with the Approbation of / His Eminence James Cardinal Gibbons / Archbishop of Baltimore / C. F. Horan and Co. / 120 West Second Street / Los Angeles, Calif. 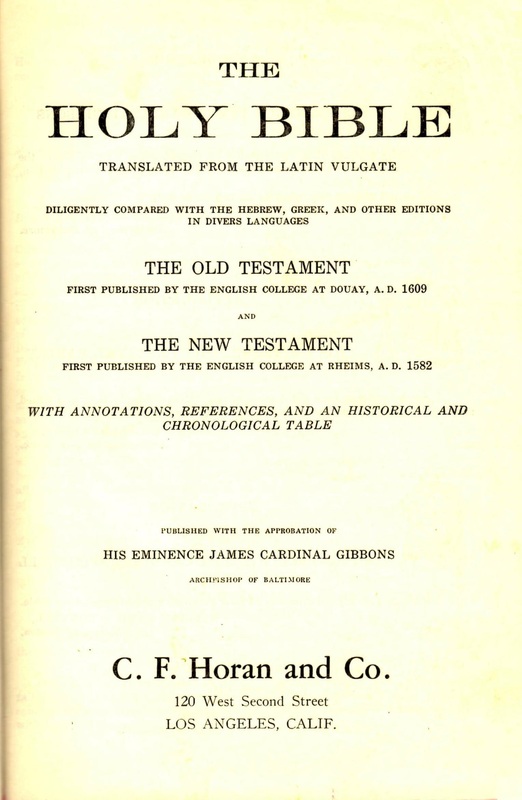 Comments A variation of the Horan imprint. 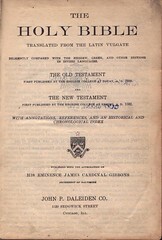 Comments An edition with the local imprints of an international publisher.